Today I started a project for the summer, making a rumtopf. 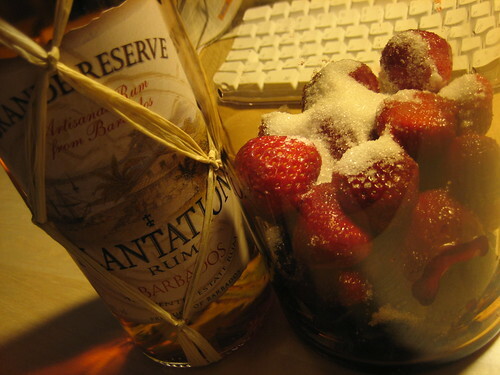 I started with a bottle of barbados rum, half a kilo of black cherries and a kilo of strawberries. 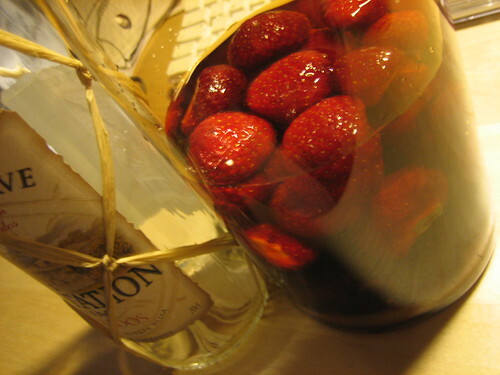 A rumtopf is fruit marinated in rum, or any other suitable alcohol. Brandy would be fine too. So, you take your favourite fruit of the season, put it in a jar, and add some rum (just enough to cover). Sometimes a little sugar is needed. Repeat when new fruit becomes available. You should store the jar in a cold place, for as long as you can. If you start now it will be wonderful at christmas time. You eat the fruit with ice cream or some other creamy dessert. I think the best use for the rum is in a toddy, or in a christmas pudding. Content updated 10 March 2019. <URL: http://boralv.se/blog/?id=1152373846>.